Taurus is the Fixed Earth sign in the Zodiac. With these “blocked and cubical formations”, the physical appearance of Taurus is among the easiest to detect. These traits can also be seen in the other fixed signs: LEO, SCORPIO and AQUARIUS. Since the features of fixed signs are often cubical, most of the celebrities here display the bovine physical appearance of “the bull”. Note, the wide fixed brows, square jaw and heavy neck and shoulders of Taurus. Other common Taurus traits include the thick, curly hair and the easily recognized Bovine eyes. As we hear in the voice of performer Cher, the voices of most Tauruses often are rich and deep. With Fixed Earth, these people are usually short on words and stubborn, but their keen senses (and golden voices) help us enjoy the delights of this world. As these earthy souls move at a leisurely pace, their fixed mannerisms shape the physical qualities in their body and facial expressions. 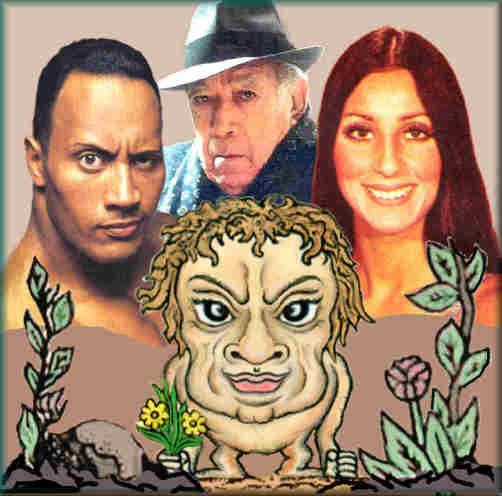 With The Rock (Dwayne Johnson), we see the broad shoulders and the powerful strength of fixed Earth. Dwayne and the legendary star Anthony Quinn show how the large pupils in the eyes drop on the outer edges, to display the expression of a contented bovine beast. A Taurus Moon or Rising Sign or a strongly aspected Venus will also enhance these qualities. This facial collage displays the fixed Earth qualities and the physical appearance of six celebrities who share a Taurus Sun. It also shows how different astrological components alter their disposition and personality. In this herd of Taurians, George Clooney is the one who most bviously shows the mannerisms and appearance of Taurus. His earthy Capricorn Moon and watery Pisces Ascendant supports the garden of his Sun. 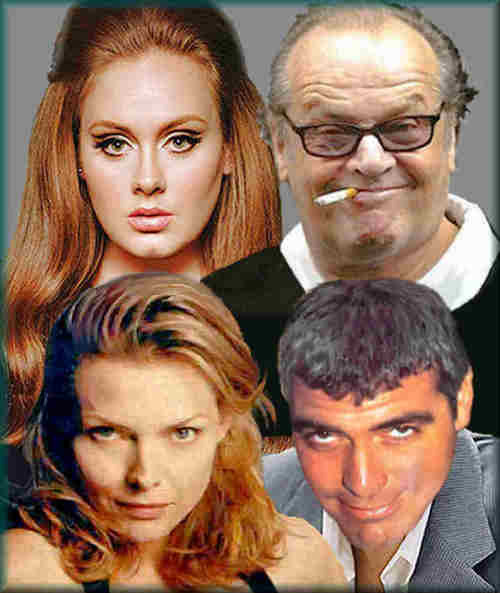 Surprisingly, Adele has a Sagittarius Moon and Aquarius Rising, but she (like Clooney) seems firmly anchored to the ground. His is due to the fact that her Moon is the only fire in her chart. She have five components in Earth and five in fixed signs. This and the fixed Ascendant enhances her bovine appearance, as it gives her voice a phenomenal range and richness in tone. Like Adele, Jack Nicholson has five planets in Earth signs, but this not a contented beasts, for red flags of fire are constantly waving in his face. Venus, his Sun’s ruler is in Aries; His Mars is in Sagittarius. Pluto is near his Leo Ascendant and it sextiles his Sun and Virgo Moon. Michelle Pfieffer also have a Virgo Moon as well as a Gemini Ascendant. She is more mercuric than the average Taurus. However, her Mars and Venus are in liquid Pisces and this makes her personal components “elementally balanced”. This water complements her sensual luminaries; The beauty of Venus is magnificently displayed in her physical appearance.